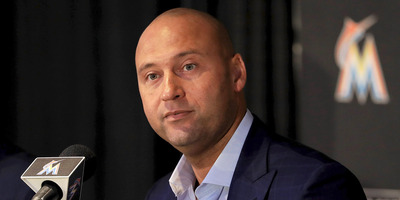 Derek Jeter held a town hall with Miami Marlins fans on Tuesday and was criticised for his handling of the team’s rebuild. Jeter has been under fire as co-owner of the Marlins for team moves, namely the Giancarlo Stanton trade. Fans told Jeter they were upset by team’s dramatic tear-down, arguing against the team’s decision to cut costs and rebuild. Derek Jeter, new co-owner of the Miami Marlins, held a town hall with season-ticket holders Tuesday night, and was taken to task by angry fans. Jeter has come under fire during his brief tenure with the Marlins for a dramatic tear-down aimed at lowering costs. Jeter’s most infamous move thus far was trading Giancarlo Stanton to the New York Yankees for a return that left most feeling the Marlins got robbed. The Marlins have also traded notable big-name (and big-money) players like Dee Gordon and Marcell Ozuna this offseason. Marlins Man also asked to be more involved with the team. Jeter apparently drew laughs by offering to let him throw out the first pitch if he renewed his season tickets on a 10-year plan. At times, the meeting got messy. According to Barry Jackson of The Miami Herald, a crying fan told Jeter they could have signed a pitcher and contended for the playoffs, to which Jeter asked which pitchers they could have signed. According to Jackson, when Jeter told fans to be patient, an older man said he didn’t have many more years left. The Marlins have posted a losing record for eight straight seasons and have not made the playoff since 2002. Jeter tried to explain his rationale to the angry fans. Jeter’s plan may not be all that rare – plenty of teams go through tear-downs and cut costs – but clearly, the timing and execution is a touchy point for fans. Few teams go through such dramatic and up-front rebuilds after years of failing seasons while trying to be a good team. That the returns of Jeter’s work have been underwhelming haven’t helped his cause.